I joined the workforce fulltime in 1980. That means for thirty-one years I’ve been paying FICA taxes. Lately, I’ve wondered at what I receive in return for this tax. While no one likes paying any tax, the necessity of financing the government requires some sort of tax. This is where all the arguing begins and politics become life’s only true quagmire. Rather than getting caught in the endless political debate over this or that tax, let’s look at just how the system actually works compared to how is should work. The system is overwhelming to look at as a whole so focusing on just FICA allows us to at least see the path through out nation’s taxation swamp. Just what is FICA anyway? If you ask someone, they might tell you it is Social Security or it is the money you can’t get back on your tax return. While correct, there is more to it than that. FICA stands for the Federal Insurance Contributions Act. It came to be during President Roosevelt’s New Deal in the 1930s. Back then, it did simply fund Social Security to address three specific issues, retirement, disability due to injury, or congenital disability. In the 1960s, Medicare and Medicaid were added and the percentage tax increased to cover the additional costs. So, FICA is a way to fund federal assistance programs for citizens in what is called a “pay-as-you-go” system. “Pay as you go” simply means our payments today are used for people who paid in before. There are, of course, exceptions. No one expects a two-year old to be denied access to this system because they have not paid in yet, but eligibility is a whole other argument – remember, it is a swamp in there. The idea is this: as our population increases, more people pay the tax and cover the costs of prior generations of workers. Sounds great in theory… in theory! Had our wonderful elected officials in Washington simply put the system described above in action and invested the money in US Government bonds, it would work. Of course, that is not what happened. Rather than buying bonds as most people think of them, they came up with a whole new type of bond that is closer to an IOU than a typical government bond. The tax we pay for FICA does not go to fund Social Security Issuance (SSI), Medicare, or Medicaid. It goes to the US Treasury, who writes the IOU-type bond to the various programs concerned. When one of the programs needs money, they send Treasury a bill. Here’s the problem. The Treasury spent the money. It is a way for our government to use this money for whatever they want and not raise our taxes to do it. The money has been used for everything from sending men to the moon to fighting wars in far off places. Now, as more citizens retire or otherwise draw on the programs, the monthly intake in FICA tax no longer covers the outlay. In other words, the Treasury is paying more to the programs (in principal and interest) than it takes in. Now, the federal government must take money raised for other uses to pay for the programs they took the money from in years past. Had they truly invested the money, we would simply be drawing down the participle of our investment. If in time, more money is needed to cover expenses, the FICA tax would need to increase to cover it. It would be a case of paying for what we get, or “pay-as-you-go,” the way the system was initially envisioned. This is also where the argument over “entitlements” begins. We call them entitlements because we, the citizens that paid into the system, have no property right claim to the money we paid in as we would with some sort of private insurance. In 1960, the Supreme Court settled the argument. Congress gave to themselves the authority to add, limit or do away with benefits as it sees fit. In other words, they took our money; made us a promise and we are powerless to make them keep that promise. As it stands, the government ran up a huge tab (part of our national debt) by converting the money we paid into FICA, into IOUs the government does not have a legal responsibility to pay. Of course, not paying it will be political suicide but changes to payments or reducing the payments may be more palatable to the general public. This is why officials wishing to reduce payments frame the issue as people gaming the system or taking advantage of a system of “entitlements.” They try to make is seem they want to fix a dysfunctional system while looking after the good of the people. What they really want is for us to keep paying the money so they can spend on their programs rather than its intended purpose. They don’t care we paid the money to have these programs. In the end, I am not against changes to the system. Especially if the government collects the money, spends it, then complains about paying the system back. So, there is the truth, the government cannot give me my money back because they spent it on things none of us gave them permission to spend it on. If anyone of us tried that; we would be put in jail for embezzlement. TED.com is a wonderful website that explores ideas. In fact, their tagline is “Ideas worth sharing.” They bring together an eclectic group of people to promote new ideas or simply how to see old ones in new ways. TED stands for Technology, Entertainment, Design but don’t let then name fool you, at its core TED is about people helping the world improve. The organization has grown beyond its initial focus on the three groups of its name to include people from all walks of life with ideas they wish to share. Simply put TED represents the best humanity has to offer. During its evolution, TED developed something called TEDx events, with the “x’ meaning independently organized events. For instance a group from the National Aeronautics and Space Administration (NASA) formed TEDxNASA (click here to see the group). It is great to see world-class scientists bring their particular area of interest into a format mere humans can understand. In watching the various talks, we learn about current and projected programs underway at NASA. After a talk, one cannot help but feel it is worthy of our support and funding. Unfortunately, it is the funding that proves more problematic than support for the idea. For example, in November of 2009, NASA scientist Joel Levine spoke of the need to return to Mars (Here is the link). In this project, a group of over one hundred scientists and engineers are working on developing a craft, called ARES, to fly around Mars and collect all sorts of data. In watching the presentation, as well as visiting the ARES website, amazement is assured and it becomes obvious that NASA still attracts the best and the brightest amongst us. Even so, it is valid to question just why we want to do this and what is gained. Rather than give that answer, as their website addresses the gains, the program’s cost becomes the issue. Funding one program over another is painful. Just as a mother cannot choose one child above another, NASA holds affection for each program it undertakes. Still, no two children have exactly the same talents, and no two programs can produce the same results. Just as one child might have to wait for its needs while another’s needs are tended, so must programs wait for funding. The debate over NASA funding is especially heated during this time of economic hardship. Detractors of the space program see it as money to be diverted, while supporters point to long-range returns on investment as proof funding is worthwhile. In the end, funding is beyond the control of NASA. It is in their best interest to deal with the reality of funding and set clear priorities. In other words, they must pick which child (project) to support. The leadership of NASA needs to give focus to the organization, focus that has lacked since the days of the Apollo program. During the Apollo era (1963 – 1972), NASA had a lazar-beam like gaze on its goal – exploring the moon. Even other major programs, Gemini for instance, added to the over all goals of the Apollo program. That type of focus needs to return. 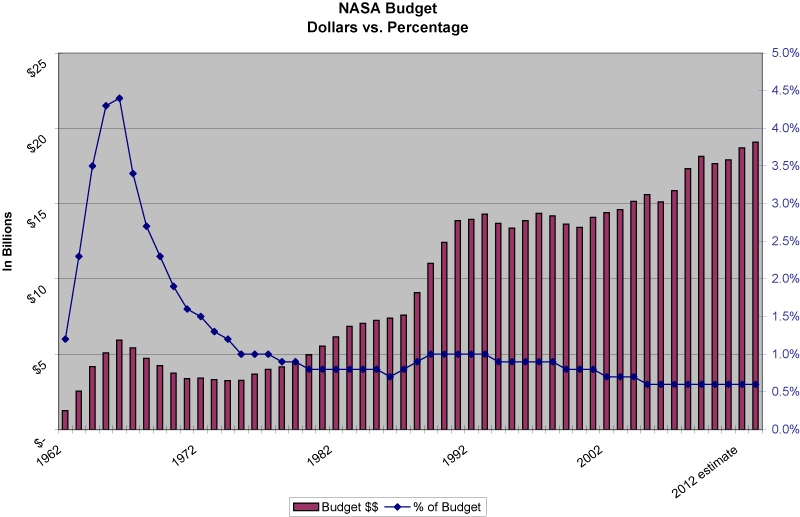 During the 1960s, NASA’s budget (click here for Historical table) fluxed between 1.2% and 4.3% with an average around 3% of the overall federal budget. Currently, the NASA budget is approximately 0.6%. Given the monetary increase of the overall budget, NASA taking a smaller percentage is not that troublesome. As the graph illustrates, the money given to NASA has increased exponentially, still there is insight gained from some simple observations. In the 1960s, NASA used roughly 3% of the federal budget and focused on reaching and exploring the moon. They achieved that goal. Now, NASA uses less than 1% of the federal budget and spreads it over more than 85 active programs dealing with many divergent areas, everything from studying polar clouds to deep space exploration and most everything in between. Looking at any one program in a vacuum supports funding. Again, they are all worthy, but as wonderful as they may be, the checkbook is not unlimited and NASA does not exist in a vacuum. Supporters of NASA often point out nearly three times as much is spent in the United States on pets than the space program (the American Pet Products Association (APPA), estimates $47.7 billion will be spent in the U.S. in 2010 on pets compared to NASA’s just over $17 billion). The point being that NASA does not receive much support in the larger scope of things. As true as that point may be, it is irrelevant. NASA has just over $17 billion to spend. That’s it! In the current climate they will not receive more. The fact is they must fight to keep funding at its current level. Faced with that reality, perhaps returning to goal oriented priorities, like in the Apollo days, is warranted. If Mars exploration is the priority, focus funding on programs that support that goal. Others will have to wait or modify their program to support the goal. In the end, the leadership at NASA must make some hard choices. Congress is not going to provide money to fund every project regardless of it worth. By focusing on projects with common goals (i.e. exploring Mars), targeted funding will produce the best results. Otherwise, all projects receive minimal funding and produce minimal results. Back in when I was in the military, I learned a saying, “there is no need to defuse a bomb that has already gone off.” For the most part, the current healthcare debate is a bomb that has gone off. The U.S. government currently controls the majority of the healthcare dollars the nation pays. The problem we have is understanding this fact due to its complexity. This complexity allows pundits to twist and mold data to fit any argument the wish to make, resulting in frustration, confusion, and a lack of trust for all concerned. If you want to upset a group of people, you only need to bring up the subject of healthcare reform. No matter the group, opposing opinions are bound to exist, opinions, for the most part, based on hysterical news coverage that has little to do with reality. We become embroiled with arguing over topics as single payer, mandated insurance, and the dreaded “S” word – socialism. When people are confused, the best choice seems to do nothing at all, maybe this is the true objective of the pundits, to confuse us and maintain the status quo. In reality, the government directly controls programs like Medicare, Medicaid, and various other more limited plans. According to the government’s Center for Medicare & Medicaid Services, these programs, and health department budgets account for approximately 53% of our National Health Expenditure (NHE). The NHE is the total amount of money spent in the United States per year from all sources on healthcare; the 2009 estimate is around $2.3 trillion. 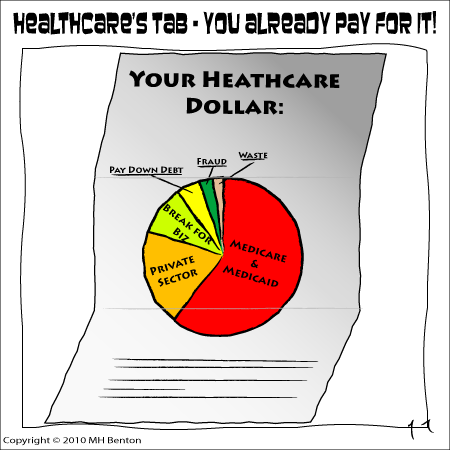 In addition, there is another cost we indirectly pay that adds to the percentage paid with tax dollars and it is hidden from view – healthcare subsidies to businesses. Businesses in the U.S. enjoy a $200 billion a year tax write-off on the cost of healthcare. In other words, the U.S. government took in $200 billion less last year than it could have giving big business a break. Taking this money into account, our government controls about 62% of the total cost paid for healthcare each year. The problem is not the tax break, it comes from who benefits for the $200 billion – only businesses that provide healthcare. This means the rest of America subsidizes the healthcare of businesses like General Motors and A.I.G. and the little guy goes without. This subsidy, in effect, is a Medicaid-style payout. It is a quasi-tax all Americans pay to the benefit of a few. 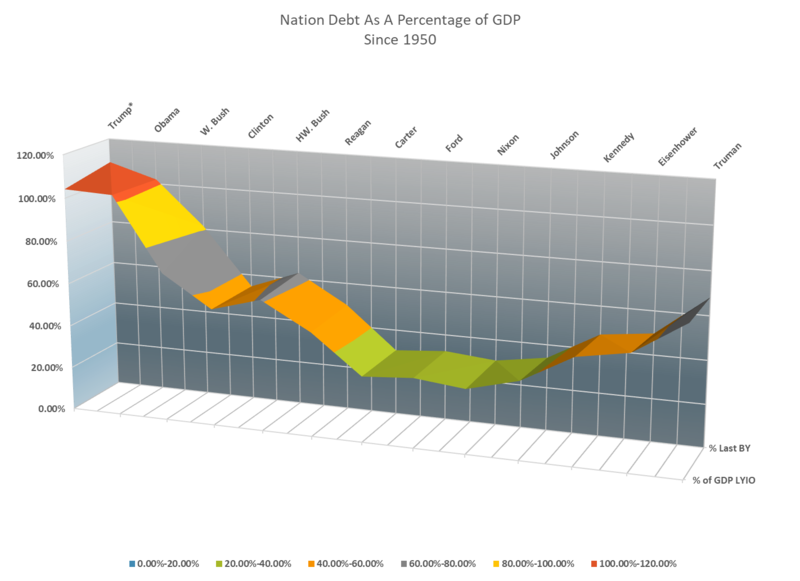 The $200 billion loss affects the general revenue, requiring a higher debt level to make up the difference; it adds to our national debt every year. It is a bad deal for all involved, except big business of course. In the end, it is not a question of should we have government paid healthcare, we have it now. The only real debate is in how to create a system that makes sense and benefits all Americans rather than select groups.